This weekend is Memorial Day weekend. 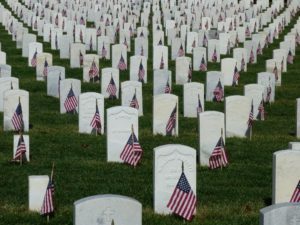 Memorial Day is not a Church holiday but a civic one. Still, as citizens of the United States, it is appropriate that we recognize the day in some fashion, much like we vote in our elections or pray for our elected leaders. All this, and more, is part of our vocation as citizens. Memorial Day is set aside to remember those members of our Armed Services that have fallen in battle. It is, therefore, different from Veterans’ Day. I am a veteran, but I didn’t die in conflict, so Veterans’ Day recognizes my service, and the service of so many others. Memorial Day, though, recognizes those who gave the lives in defense of our nation. Days to remember those who have fallen in war reach back to ancient times. This practice continued in America, but there was no uniform selection of dates. This changed rather quickly with the Civil War. In that conflict over 600,000 died. Many areas began observances to remember these men even before the war was over. This has led to many different cities claiming to be the birth place of Memorial Day. Originally the day was called “Decoration Day” because the graves of the fallen were decorated. In the US, the day was focused on those who had died during the Civil War. As the Civil War was certainly not the last war our country was involved with, the day gradually became about those who died in any war. The name “Memorial Day” was first used in the historic South. It did not become common until after WWII and was officially changed to Memorial Day in 1967. May 30 was selected, way back in 1882, as the day for the commemoration because no major battle in the Civil War was fought on that date. It, therefore, wasn’t associated with either the Union or the Confederate cause. In 1967, Memorial Day was moved to the last Monday in May for no other reason then to give us all a three-day weekend. In New Castle County we have a Veterans Memorial Cemetery at 2436 Chesapeake City Road, Bear. They have a special service in honor of our war dead, sponsored by the Veterans of Foreign Wars. On Monday (Memorial Day) there will be a service, hosted by the Korean War Veterans Association, at the War Memorial Plaza, Delaware Memorial Bridge, New Castle. Both services will begin at 10:30 AM. Many associate poppies with Memorial Day. This began in 1918 and has grown since. In 1915, following the Second Battle of Ypres during WWI, Lieutenant Colonel John McCrae, a physician with the Canadian Expeditionary Force, wrote the poem, “In Flanders Fields.” Its opening lines refer to the fields of poppies that grew among the soldiers’ graves in Flanders. In 1918, inspired by the poem, YWCA worker Moina Michael attended a YWCA Overseas War Secretaries’ conference wearing a silk poppy pinned to her coat and distributed over two dozen more to others present. In 1920, the National American Legion adopted it as their official symbol of remembrance. * or “grows.” McCrae used both words in ending his first line. Heavenly Father, as our nation pauses today to remember those in the military who have given their lives for freedoms we enjoy, we pray you would have us all look to you for strength, comfort and guidance. Be with all who serve in our Armed Forces. Bless them and their families. Grant your loving protection. Let peace prevail among all the nations, O God. Especially let your mercy rest upon our land, even as we acknowledge with thanksgiving your past goodness on this country. If it is your will, preserve the lives of the men and women in uniform as they defend our citizenry. Most of all, we pray that you would turn the hearts of all – military and civilian – to your holy Word where we find the true peace for our sinful souls that surpasses all understanding. Keep us repentant of sin. Move us to know, take hold and treasure your saving grace. In the name of Jesus, our Savior and Your beloved Son, who alone gives this peace and hope for eternity, we pray. Amen. Lord God, You have granted to us a good land and blessed us with those who have defended it, even at the cost of their own lives. We humbly give you thanks for their sacrifice and remember current members of our military services, asking You to stretch forth Your almighty arm to strengthen and protect them. Support them in times of war, and in times of peace keep them from all evil, giving them courage and loyalty. Grant that in all things they may serve with integrity and with honor. In the name of Him who died that we might live and have eternal freedom. Amen.